While half of the interior design world is turning towards cold colours and minimalist looks, the rest is focusing on cosy inviting rooms with rich colours and multiple textures. African themes tend to bring the feeling of being on holiday straight into your home. Bringing something back from holiday with you is a traditionally English trait, however more and more people have started aiming their themes around destinations and hotels they have visited. Many of our clients over the last few years have been focusing more on the darker stains we offer. From the very dark, Wenge to the truly textured wooden feel of Smoked Oyster – these colours are essential for any African theme. The beauty of an African influenced theme is it doesn’t necessarily have to have ornamental elephants sitting on every table, the blending of varied textures and rich colouring is your palette to create on the canvas of your room. While more popular in bedrooms and lounges, the look can also be utilised in bathrooms – with deep reds, a relaxed yet passionate aura is created. Perfect for losing oneself in contemplation. 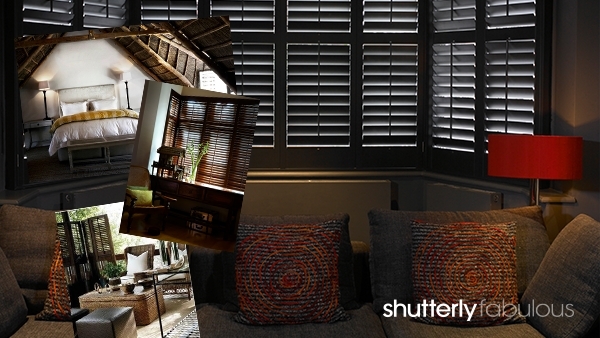 By using shutters in a room like this you can direct light exactly how you require. Opening your shutters wide to allow the full blast of the savannah sun, or by setting the louvers to an angle you can allow ‘broken light’ into your room – truly mimicking up the effect of a sunset breaking through the dried branches of an acacia tree.